Jimbob gives his thoughts on the Collingwood defender who should improve again in 2018. For the 97.8% of you that don’t own him on the Drawing Board on DT live, you probably weren’t considering him as a back option. I’ll see what you can do to at least consider him. If you don’t know much about the man with an elite junior baseball background (let’s see the commentators use this one!) Scharenberg was a gun U/18 and the joint winner in the SA MVP in his final year of Junior Football. Described by Choco Williams as ‘The best Schoolboy since some bloke called Carey’, the kid can obviously play, and we finally got to see a snippet of his potential in 2017. Scharenberg got the call up from the magoos in round 10 after showing he can a) stay on the park, and b) sustain form which included a 41 disposal game against Box Hill. His first five games didn’t exactly set the world on fire and he even got dropped twice. 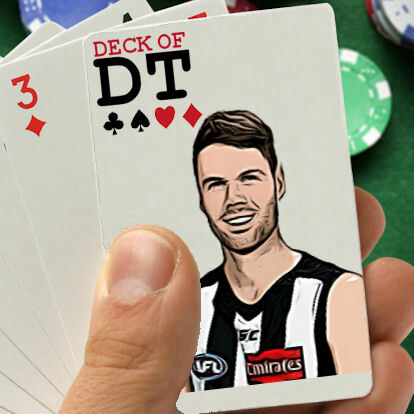 After another 35 disposal 13 mark game (140 points), Collingwood must of realised that he wasn’t the problem and swiftly recalled him back into the team. The next four weeks saw Scharenberg cement his place in the team for the remainder of the season and average a very nice 96.5 AF/DT points a game, which included 24.5 disposals and 9.5 marks during that time. While a four week streak of form is admirable, it’s nothing to hang your hat on. The more interesting stat for me is the fact he was 6th in the league for average marks for players who played more than five games, 15th in average rebound 50s, and the top Collingwood player in these stats too. These stats definitely suggest that he will be the man they want the ball in the hands of moving it from down back for the long term future, with plenty of +6s coming his way. Another reason I think to consider Scharenberg is the overall players available in back line. They don’t exactly fill me with excitement. Docherty is gone, Yeo’s last 8 games average was 87, Simpson will be 34 before season’s end and Hurley had a 9th year breakout. Michael Hibberd at $652,000 is starting to look like a good investment. Scharenberg is $104,000 cheaper, for a potential 5 point less average. with a lot of appealing players up to stack your forward line with, the backline could well be the one to scrimp on and save money. Well there are a few. The first and major reason not to pick him is the obvious injury history. Scharenberg is entering his fifth season on an AFL list and has just 14 games to his name. Marcus Bontempelli, the pick before him, has 85. With foot surgeries and two knee reconstructions to his name already he may be a player who we never get to see the full potential of. Have we really seen enough of the man they call ‘Shaz’ to invest $548,000 in, when Jason Johannisen is $13,000 less? Are there too many ‘good ball users’ in the Collingwood team? Jeremy Howe, Jack Crisp, Tom Langdon, Brayden Maynard and Josh Smith to name a few. Will they all have a few good games each and take points off each other? Queen – Sometimes you have a gut feel about players and I just have one about Scharenberg. 2017 was the year of consolidation and the year that Shaz stayed on the park for a whole season, got some run into his legs and finished the season on an upward curve. He can definitely push an average of 90 with another clear run which is a 12 point gain on last year and your last upgrade target in your back line. If he averages 95 for the season, he is likely a keeper and a great unique pick. I am looking to pick him in Fantasy, but would err on the side of caution in limited trade formats. Scharenberg is out of contract at the end of 2018 and I would not be surprised if both South Australian clubs are putting long term offers in front of him such is the quality of this bloke. Just remember, if coaches had Dylan Roberton in their starting squad, they would have been laughed off the internet for it. Unique is not always bad. Great article Jimbob, definitely makes you think amd even stick him on the watchlist for now. Agree the backline looks the place to scrimp and save a few dollars at this stage. Good shout, hadn’t considered him at all but you make a great case. Scharenberg was the first player picked in my DT side this season. Literally.